Pattern Description: A six-sided object spins off feathers to make a whirling star as the main piece of this pattern. 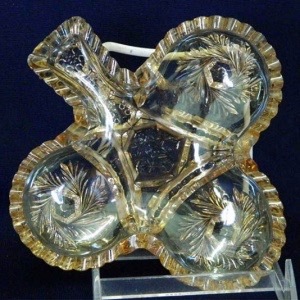 The pattern consists of snowflake-like whirling stars and was an early pressed glass pattern. This was probably produced later in the carnival glass era. These are bridge set pieces, probably shaped as heart, spades, diamond and club. The glass is pressed to appear like cut glass and lightly iridized.